Troysus finished what he started. Since we’re about to talk about the Steelers, I know many of you are wondering why I haven’t written anything about Hines since his first week on Dancing With the Stars. The reason is that I hate his stupid face. KIDDING. Please don’t whip me with your wet Terrible Towels. I simply have too much recording on my DVR on Mondays (I’d tell you which shows, but you’d judge me with your judgey judgments) and am never really able to catch it live because MAH LIFE IS CAH-RAZY, which is the phonetic spelling of how I shout it into the sky at least once a day. I try to follow what I can online after the fact. Things like his partner getting hurt (the video of that will make you cringe. I mean … OUCH! ), Sally Wiggin and Troy and Jerome and others showing up to support him as he moves on to the finals, his perfect score on the tango, etc. So just because I’m not writing about it, doesn’t mean I don’t care. I’m late to this because [shouts to the sky with raised fist] mah life is cah-razy! 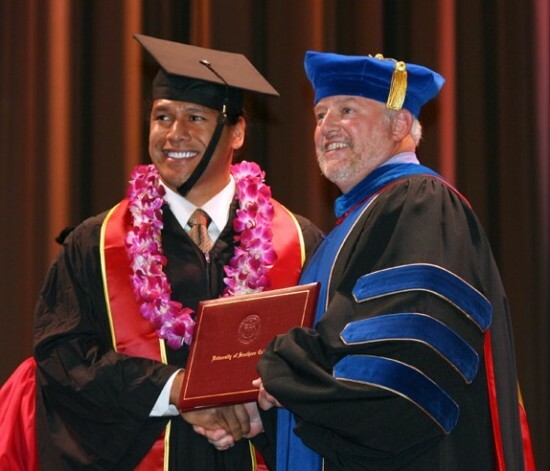 Troy Polamalu has spent his time off from football thanks to the labor dispute by finishing his degree at USC. Look at Troy on the day he walked to get his diploma for a bachelor’s degree in History this past weekend. The majority of top picks in the NFL get drafted before they complete their college education. I truly love football and it’s such an immense blessing and privilege as an athlete to be given the rare opportunity to use those talents at the highest professional level, but it’s certainly not a replacement for an education. So I decided to finish what I started and walked that stage today not only because it was very important to me personally, but because I want to emphasize the importance of education, and that nothing should supersede it. He’s holding a contest for Student of the Year and will be awarding three autographed jerseys, so go to his website if you are a teacher/faculty who know some awesome students. Let’s get a Burgher one of those jerseys! I watched both my children walk that same stage a while ago . It’s very fulfilling as a parent ( more so when the parent pays the bill ) you can look it up at usc.edu ( it will take your breath away ). I now have a higher level of respect for Troy for doing what he did. So many pros never look back after getting into the big show. A real shame , more so since they got a free ride . I’ve been worried about the lack of DWTS coverage. Thanks for clearing that up. Troy is an absolutely wonderful person – what a role model! Good for Troy. Brooks Orpik did the same thing during the NHL labor dispute. Love to read about athletes who value their educations. Meanwhile, Antonio Cromartie probably spent the time fathering two more kids and can’t remember their names. Kudos Troy! I have been going to school for 20 years believe it or not. A class here and there and since I have lived a nomad type of life across the continent and even over-seas. Hopefully, when I graduate I will be able to walk across the stage and not in a Jazzy Scooter. As for Hines, it has been awesome good! If you can’t watch at least vote. 1-800-868-3403 up to a half hour after the show. Let’s show how strong and dedicated Steeler Nation is!